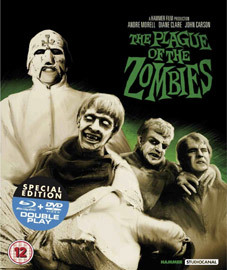 Following on from their restoration and double-play release of Dracula, Prince of Darkness last month, StudioCanal have announced the upcoming double-play (DVD and Blu-ray) release of two more Hammer favourites, The Reptile and Plague of the Zombies, both of which were directed by John Gilling and starring Jacqueline Pearce, who cult TV fans will know better as Servalan in Blake's 7. 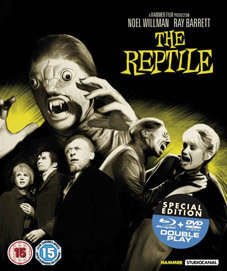 Companion films, shot back to back under the direction of John Gilling, both have undergone extensive restorations in conjunction with Hammer and Pinewood studios and had new extras especially created working alongside Hammer expert Marcus Hearn. A deadly epidemic is spreading through the remote Cornish village of GlagmoorHeath. As darkness falls its victims are found foaming at the mouth with savage wounds upon their necks. After his brother becomes another fatality, Harry Spalding travels to Clagmoor to investigate his sibling's mysterious death. With little help from the superstitious locals, Harry follows a trail of macabre intrigue that leads him to the sinister Dr Franklyn, his strange but beautiful daughter and a truly horrific family secret. Within a remote eighteenth century Cornish village, an evil presence lurks within the darkness of the witching hour, a mysterious plague relentlessly taking lives at an unstoppable rate. Unable to find the cause, Dr Peter Thompson enlists the help of Professor James Forbes. Desperate to find an antidote what they find instead are empty coffins with the diseased corpses missing. Following a series of strange and frightening clues, Thompson and Forbes are lead to a deserted mine where they discover a world of black magic and a doomed legion of flesh eating slaves, the walking dead.